One of the things that irritate me about a restaurant is when they publish a menu on their website where the prices aren’t reasonably accurate. As was the case with Northbank, their website menu suggests that the average price of a main is £15.75 (range of £12 to £18.50 – accurate at the time of this post). But on their actual menu, the average main costs £17.50 (range of £13.50 to £21). This works out to be about 11% more. I think it’s rather cheeky for a restaurant to not update their prices with reasonable accuracy as it may mislead a customer into going to the restaurant when they might not have otherwise gone. Ok, it’s only a couple of quid, but its still 11%. The décor at Northbank is pretty swanky. It looks modern and smart, has quite a masculine feel to it, and boasts of a prime location on the Thames overlooking the Tate Modern. With its location, I imagine that its usual crowd are tourists and city types. 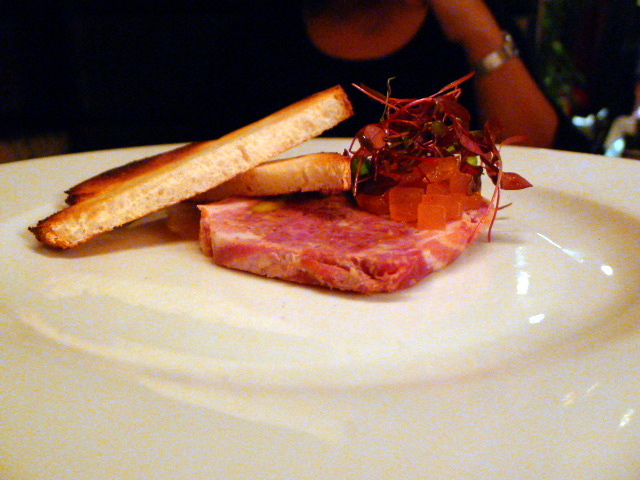 A venison, rabbit and hare terrine with quince jelly and toast (£8) was meaty, well seasoned and very tasty. This was very well done, but the piece we got was stingy. It had been very thinly sliced and could have done with about fifty percent more. Cheeky I say. 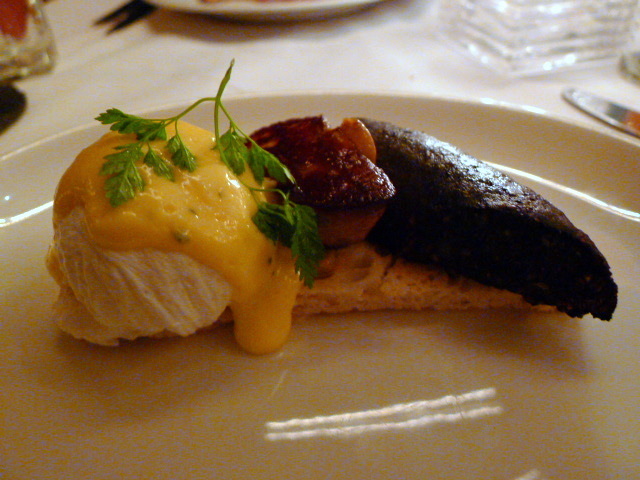 A sautéed foie gras with black pudding and poached egg (£9.50) was horrid. To be fair, the foie gras was nicely cooked and unctuous, albeit small. But the blood sausage lacked richness, was a little peppery and tasted like it had been pre-cooked and reheated in the microwave. There was no crispiness to it that would normally come with fresh pan-frying. On the side was a poached egg with hollandaise sauce. The egg was well cooked and soft in the centre, although under seasoned. But what possessed the chef to place a damp egg over toast, I will never know. As you might have guessed, the toast went soggy and was pretty disgusting. The hollandaise was well prepared with a hint of acidity, but there were no other acidic elements in the dish to counteract the richness of the foie gras. 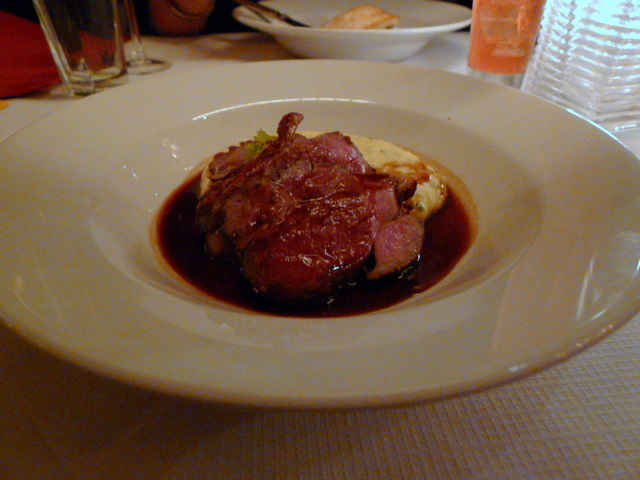 A lump of Cornish lamb (£19) was quite chewy, even though it was cooked medium rare. The sauce showed good technique and was nicely reduced. It came with a smooth truffle and herb mash. A dish of roasted halibut (£19.50) was overcooked, with the fish becoming dry and rubbery. It was accompanied by braised lentils with truffle oil which was rich and tasty. 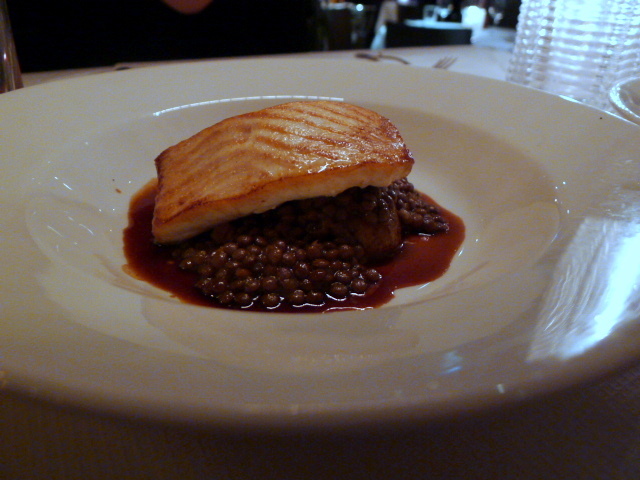 I would have enjoyed the lentils on its own, but the use of truffle oil was a little overpowering against the fish. 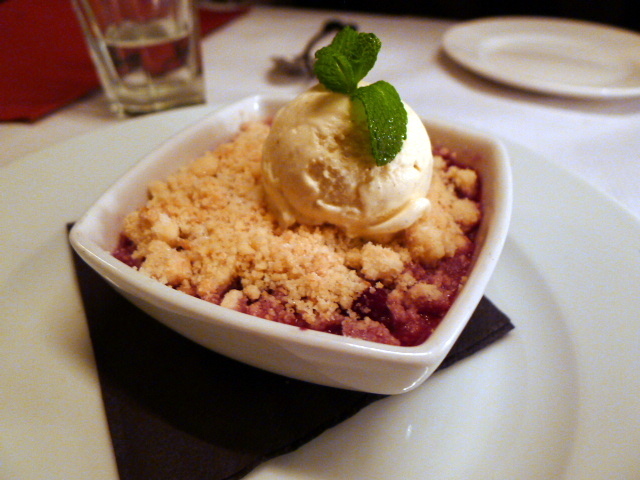 A dessert of pear and blackberry crumble with lavender honey ice cream (£6.50) was the best dish of the evening and very enjoyable. The crumble was crunchy and light, and the soft fruit was lovely and sweet. There were elements of the food which demonstrated that chef Peter Woods, who has worked at The Savoy, at The Belvedere with Marco Pierre White, and at Tante Claire with Pierre Koffman, can cook. The dessert was lovely, and the terrine was good, even if the portion was stingy. So I can only surmise that the mistakes he made (soggy toast – yuck!) were because he was careless. But irrespective of what the food was like, it was the horrendous service which sealed the deal on an entirely disagreeable evening. One of our waitresses was one of the most unpleasant people I have had the displeasure of coming across, and the way she spoke to us (snarled at us) the whole evening grated on my nerves. One of our other waitresses was nice, but we were also served by a third person whose attitude bordered on indifference. At one point, he came to our table reeking of cigarette smoke. Overall, the service was ghastly. Avoid this place. There are so many better restaurants in London. And it costs more than what you might first think. Price range: £26 to £39 for three courses. Excludes drinks and service. Just to let you know, there seems to be a few issues with the images on this review. Great review as always regardless of imagery issues! Had a very similar experience at this place recently. Very accurate and bold review. Thanks. I agree. The food was poor and it doesn’t surprise me that you had a similar experience.